The New York City Landmarks Preservation Commission's Weehawken Street Historic District Designation Report (2006), p. 29-30, describes 177 Christopher St. as follows, "No. 177 Christopher Street (which was originally No. 167 until 1885) is a 4-story factory building that for a century was associated with four firms involved in marine plumbing, heating, cooling, electrical, and repair contracting. Designed in the neo-Grec style by architect William J. Fryer, Jr., the building was constructed in 1883-84 by builder Richard Shapter, listed in an 1883-84 city directory as a mason living in Brooklyn. The property was owned by John Alden Spooner, and the building was leased to H.C. & J.H. Calkin, “coppersmiths and plumbers, steam & gasfitters, sheet iron & brassworkers, ship furnishing, galley stoves, patent metallic life rafts,” as described in a city directory at their previous address at 256 West Street. This was the first of the significant late-19th century maritime-related businesses to be located in the historic district, near to the Hudson River waterfront with its ship piers. Hervey C. Calkin (1828-1913), born in Malden, N.Y., moved to New York City in 1847 and worked for the Morgan Iron Works, becoming a dealer in metals in 1852. He was elected a U.S. Congressman in 1869-71. He established the business of H. C. & J. H. Calkin with his brother, Judson Hall Calkin. H. C. Calkin retired from the firm in 1904, and the lease here ended the following year. The next tenant of No. 177, from 1905 to 1918, was William J. Olvany, Inc., heating, piping, and air conditioning contractors. William J. Olvany, Sr., was the secretary-treasurer of the Master Steam & Hot Water Fitters Association (1916), and later served as president of the Heating, Piping and Air- Conditioning Contractors National Association. In 1920, the property was sold to Carl F. and Mary R. Oelhaf, in agreement with John H. and Margaret G. Koch. Carl Frank Oelhaf (c. 1873-1940) was born in Wurtemburg, Germany, and emigrated in 1880, while his wife, nee Mary Ruf (c. 1874-1961), was born in New York of German descent. In 1910, the Oelhaf family had purchased the property next door, No. 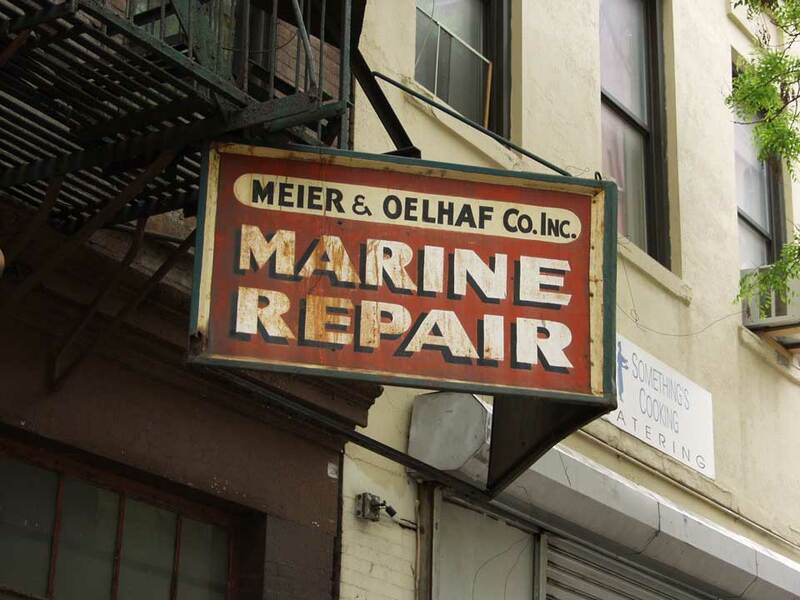 179 Christopher Street (lot 37), for the Meier & Oelhaf Co., its marine plumbing supplies business. Meier & Oelhaf was listed at that address in the 1918 and 1925 city directories, with Carl F. Oelhaf, president, and Mary, secretary-treasurer." The firm of Meier & Oelhaf Co. Inc. was founded in 1905 by Frank Meier (1868-1941) and Carl Frederick Oelhaf (1872-1940), both immigrants from Germany. The business was located originally at 402 West St., New York City, and moved in 1907 to 179 Christopher St. According to the Landmarks Commission report Carl and Mary Oelhaf bought 177 Christopher in 1920, and Meier & Oelhaf were listed at that address from 1920 to 1984. Frank Meier became a naturalized American citizen 19 August 1880, when he said that his occupation was "tinsmith." He then appeared in the 1900 U. S. Census living on Grand Avenue, Queens. His occupation was recorded as "carpenter." By 1910 he lived on Grand Avenue, Leonia, New Jersey, and his occupation was "Contractor, Marine Factory." By 1920 Frank Meier had left New York and lived on Miramonto Boulevard, San Antonio, Los Angeles, California, where he owned a ranch. In 1940 he was 71 years old, a widower, living with his son, Frank G. Meier, in Santa Monica, Calif. The Meier Family Tree on ancestry.com includes several photographs, including the sign at 177 Christopher St., a portrait photo of Meier himself, as well as a wall-painted Meier & Oelhaf sign. Included also is the information, "Frank Meier became a copper smith and met Karl Oelhaf while working at a company called Caulkins. In 1907 they started their own company. His father, Jacob Meier also worked with his son at Meier & Oelhaf." Carl F. Oelhaf was recorded in the 1900 U. S. Census living on East 7th St., Manhattan. His occupation was "tinsmith." In 1910, like Frank Meier, he lived in Leonia, New Jersey, where he remained until his death 12 Nov. 1940. In 1922 Charles Frederick Oelhaf applied for a passport and declared that he was born in Hessley, Württemberg, Germany, 18 January 1872, that he emigrated from Hamburg June 1895, and that he became a U. S. citizen 8 August 1905. Carl Oelhaf's death notice, New York Times, 14 Nov. 1940, spelled his name incorrectly, Oelhof instead of Oelhaf (OF at the end rather than AF). Although Frank Meier left the company and moved to California, the Meier and Oelhaf families remained closely related. Meier's son, Frederick G. Meier (1894-1948) married Carl Oelhaf's daughter, Katherine Oelhaf (1899-1994). This ad for Meier & Oelhaf appeared in the journal The Master, Mate and Pilot, vol. 1, no. 11, April, 1909. Their address from 1907 to 1919 was 179 Christopher St.